Xponential Growth Solutions and Highland Capital Advisors announce the 2017 Western Washington Fiduciary Summit on March 9th at the Columbia Tower Club in Seattle. This Summit is part of the Retirement Plan Road Show: a national series of educational workshops designed for Finance, Human Resource, and Benefit executives, as well as plan sponsors and fiduciaries. 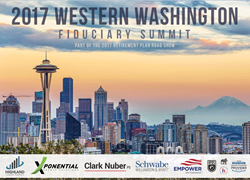 Xponential Growth Solutions is pleased to announce the 2017 Western Washington Fiduciary Summit. This Summit is part of the national Retirement Plan Road Show, a series of educational workshops that bring together both local and national expertise to interact with employers made up of Finance, Human Resources and Benefits executives, as well as Business Owners, Fiduciaries, and Plan Sponsors. Speakers will provide insights to help employers reduce fiduciary risk, identify plan upgrades, and make better decisions that positively impact participants. The summit is hosted by Bill Small, the Co-Founder and Principal at Highland Capital Advisors based in Issaquah, WA. Bill emphasizes that "the retirement industry has continued to evolve rapidly. There is a lot at stake and and the time is right for sponsors to be more discerning and diligent than ever before". In an era of complex financial products, clients need a partner they can trust that doesn't sell products, collect hidden fees or provide conflicted advice. Highland Capital Advisors, LLC is that firm. Headquartered in the great Pacific Northwest, Highland Capital Advisors, LLC is a Registered Investment Advisor, focused on pragmatic solutions for plan fiduciaries and individual investors. Through principled conduct we build trust and help our clients traverse the financial landscape with confidence. Highland is led by industry veterans Bill Small and Rick Wyman. Before forming Highland, Bill managed a national consulting practice serving some of the largest retirement plans in the country. Rick was the CFO and lead advisor for the largest independent consulting firm in Seattle. Collectively, our Principals were responsible for the oversight of nearly $20 Billion in client assets. Seeing a unique opportunity to combine forces and bring a refreshing option to the market, Highland Capital Advisors was formed. Xponential Growth Solutions (XGS) unites 401(k), 403(b) and retirement plan sponsors with elite resources and exclusive connections. Through research, fiduciary summits, and industry expertise, they help the nation’s retirement plan sponsors, fiduciaries, and trustees evaluate their plan and navigate the retirement plan industry. Working to help America reach their retirement goals one retirement plan at a time, XGS also founded the Retirement Plan Roadshow - a national series of fiduciary educational summits dedicated to human resource, finance and business professionals in charge of America's 401(k), 403(b), and retirement plans.